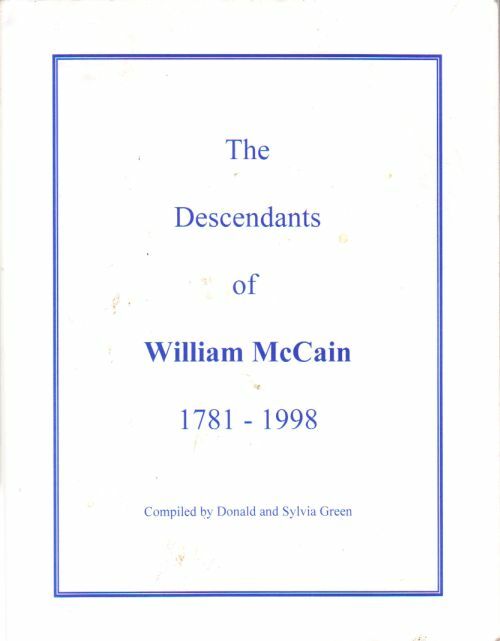 Description: William McCain, son of William McCain, was born in about 1782 in Maryland. He married Elizabeth Hannah Newcomb, daughter of Samuel Newcomb and Nancy Fritz, in about 1810, probably in Jefferson County, Pennsylvania. They had eleven children. He died in 1862 in Pepin, Wisconsin. Descendants and relatives lived mainly in Wisconsin, Minnesota, South Dakota, Nebraska, Colorado, Oregon and California. Includes Archer, Becker, Butler, Carroll, Crain, Crawford, Cunningham, Finch, Florin, Green, Hanvelt, Hetrick, Luther, McGee, Newcomb, Williamson and related families. Cover has some dirty spots, Page ends are a bit dirty. Some pages dog-eared. Appears to be clean, u marked insides.